As in past years (2017, 2016, 2015, 2014, 2013, 2012, 2011), I am putting together a new list of my top tech. The list will contain my favorite things from the last year, even if they were available in prior years. By "tech" I am basically including any new toys, apps, etc... that I find cool and/or useful. The prices I have in the article are the current prices, but I would expect them to fluctuate between now and the end of the year. Apple Watch Series 4 - ($429) This wasn't an easy choice, as usual. However, this Watch can literally be a life saver with features that will call for help if you fall and the EKG features that are forthcoming. The 44mm is easier to read that the older models, you now have the ability to download audio files to listen to later with headphones, and it gets faster every year. It still isn't perfect..they should allow you to listen to podcasts on its speaker and it should have some always on clock face options. However, it is such a big step forward from prior generations that it belonged at the top of this year's list. I got the cellular version just in case I want to use it down the road, but in hindsight the regular version makes much more sense unless you know exactly what you want to use cellular for and are willing to pay for it with your cellular company. Sony A7 RIII - ($2798) - This camera was a game changer with its small mirrorless design, adapters that make it work with many lenses, its 42.4 megapixels, and its fantastic 4k video capabilities. My only complaint is the high price of Sony lenses and the fact that the LCD is not fully articulating. Other than that, it is close to perfection. Breville BES880BSS1BUS1 Barista Touch Espresso Maker - ($1,124.77) - I have a review coming of this espresso machine. However, it is amazing because it makes it easy to make perfect espresso, cappuccino, latte, etc. with its easy to access recipes on its LCD screen. It will also let you customize and save your own recipes. It is a beautiful machine that makes great tasting coffee with ease. The Nespresso Expert by Breville and the Saeco Incanto Carafe Super Automatic Espresso Machine - The Nespresso uses small pods to make great espresso every single time. I have one so I can get a variety of different flavored espresso drinks. The Saeco is more traditional because it uses real coffee beans, but they have made the process so much easier for those that just want to hit a button and be served fantastic coffee. LaCie DJI Copilot BOSS Computer-Free in-Field Direct Backup and Power Bank with SD Reader - ($349) This is the ideal hard drive for backing up your photos no matter where you are. It works with SD cards, iPhones, iPads, computers, etc. It is the perfect solution for the road warrior. George Foreman GBR5750SCBQ Broil 7-in-1 Electric Indoor Grill, Broiler, Panini Press, and Waffle Maker - This is my second George Foreman grill and this one takes it to a new level. It is one of the best ways to cook fish because it locks in the juices and flavor. It is excellent for sandwiches, Panini, Waffles and so much more. The best part is that it can stand up on one end, so it takes a lot less room on my counter than the last one I owned. HomePod - ($349) It is nearly impossible to get great sound from a speaker with such a small footprint. However, somehow, Apple had done it. They also added some smart features that enable you to tell Siri what you want it to play, turn on and off your Hue lights, etc. They recently added Airplay 2 features which means you can just tell it to "Play Sinatra on AppleTV" and music will play from your main home theater system. The one other thing that really sets it apart from the competition is the mics. You don't have to scream at it over music. It just hears the commands at a normal volume. Echo Spot - ($89.99) I have one of these in my office and it accomplishes many tasks. It can display my Arlo cameras, play music on the stereo in the room (via AUX), receive a Bluetooth signal from my iPhone, control my Simple Control app, perform calculations, add new items to my grocery list, etc. AppleTV 4K - When I first set this up, I was shocked to see the movies I had in MoviesAnywhere were now available in 4k in Apple’s movie library. The 4k resolution is amazing, However, being able to tell the HomePod to “Play Prince in the Den” and music just comes from my main system via the AppleTV just takes everything to a new level. NETGEAR Orbi Built-in-Modem Whole Home Mesh WiFi System - ($399) Orbi was my top rated product last year and they pushed everything to a new level. They now have a modem built in, so you can eliminate a separate modem from your setup. Of course, their mesh system is reliable and first class which makes the system worth the investment if you are having drop outs. 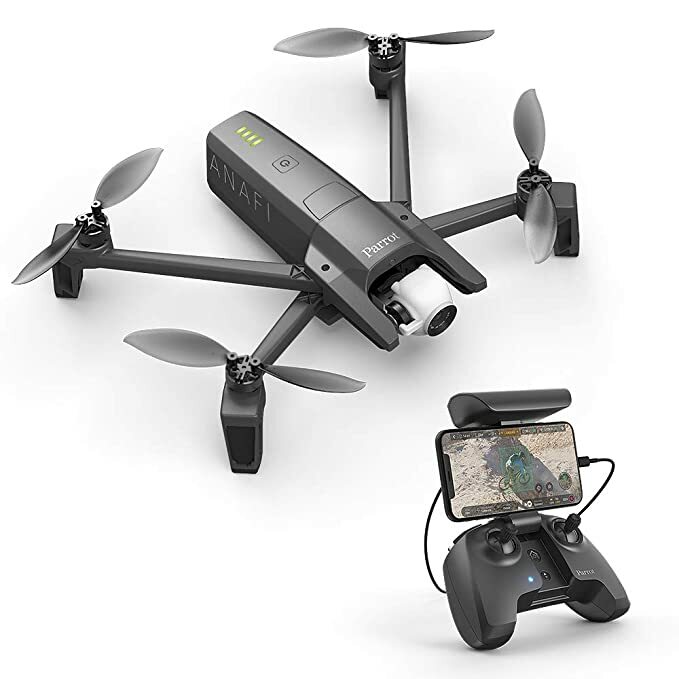 Parrot Anafi Drone - ($549) - I hesitated to put this on my list because my experience with their customer service was awful. That being said, the camera on this thing is great with HDR, 4k, lossless zoom, etc. It isn't as easy to control as my DJ Mavic, but it costs half as much. Also, one day, I had the drone with me and forgot the controller and was able to have it up in the air with just my iPhone in seconds. It also charges by USB-C, so you can use a powerbank to top it off between locations. Razer BlackWidow Elite - ($158) This is the ideal keyboard for most gamers. It has mechanical keys (which means it is nice and clicky), has macro buttons you can assign, a media wheel, adjustable RGB lighting, and its app will even allow you to control hue lights. Awesome! Eureka InstantClear NEA120 Air Purifier - ($150) - What is more important than breathing? I can't think of anything, to be honest. This True Hepa filter captures 99.7 percent of particles in the air. The patented UV LED sterilizer is a bonus. My favorite feature is the good looks and the almost silent low setting that makes it possible to run it all the time. Lots of great tech and I did not get to it all. Stuff I will review soon are theEufy 30C that takes Robotic vacuuming to a new level,﻿truly wireless headphones﻿, NVME case, and more. There are also products that I decided not to buy or might buy later. I decided not to update my phone for another year. I am happy with my iPhone 7+ and at the current prices, I just don't see a favorable cost/benefit situation. The iPad 12.7 is delicious, but I want to wait to see if Photoshop is backward compatible when it is released. If it is, I will stick with my 9.7 inch iPad Pro. I already plan on adding the Tamron 28-75mm camera to my gear list, but if it is decent, I will put it on my list next year. As with last year, there wasn't a lot of inexpensive gear on this year's list, but I guess you have to pay up for most really nice tech.